At least two people have been killed – one drowned and another electrocuted – in a heavy storm that hit southern California, uprooting trees and sweeping vehicles away. Voluntary evacuations were called, while some highways were closed and numerous flights delayed or cancelled. 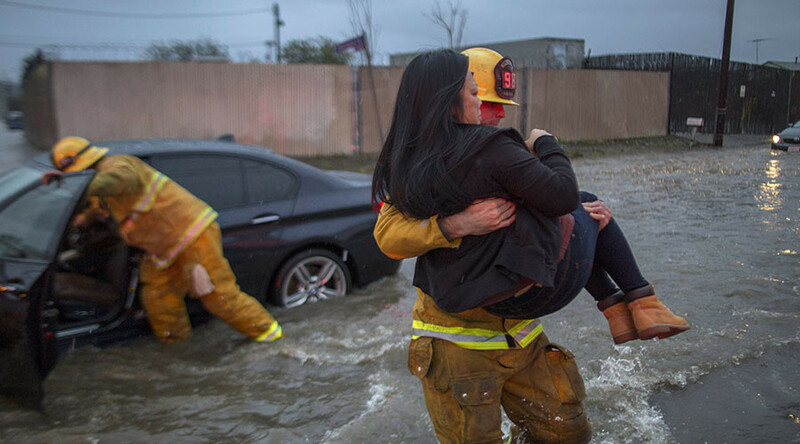 Two cars were swept away by floodwaters in Victorville, where police discovered one person dead in a submerged car, but were able to rescue another person in a separate car. Los Angeles Fire Department responded to a man in Sherman Oaks who came in contact with downed power lines. The man was found in critical condition and was rushed to the hospital, where he was pronounced dead. Two vehicles were reported to have fallen into a sinkhole in Studio City shortly after 8:30pm local time. Fire and rescue crews are on scene. The brunt of the storm hit the Golden State Friday morning and is expected to last into Saturday. With strong winds and lashing rain, trees were toppled and uprooted crashing onto houses and highways in Ventura County, Central Coast, Santa Barbara and Fremont. The Ventura County Office of Emergency Services urged a voluntary evacuation of some homes in Camarillo Springs, northwest of Los Angeles, where past storms unleashed mudflows from hills scarred by a wildfire several years ago. In Santa Barbara, the city streets became slick with water. Workers tried to clear power lines. Workers dug ditches to divert water. Rivers developed waterfalls and broke their banks. Forecasters say rain will also spread into Central California and up to the San Francisco Bay Area. As this is the surfing state, what’s threatening to some was ripe for a slide to others.